Palm-rolling: is the traditional technique to maintain locs, where all the stray hairs and parts are sectioned and rolled to tighten locs in a cylindrical motion. Tip: This technique is best performed on freshly shampooed, conditioned, damp hair. Comb- any small tooth comb that allows you to part your hair with precision. Find the loc you would like to start on, I usually start in the back of the hair. Use the comb to straighten the loc you would like to palm roll. Take a dime size of product and place on the freshly straighten part and new growth. This hair should be damp for this technique to work properly. 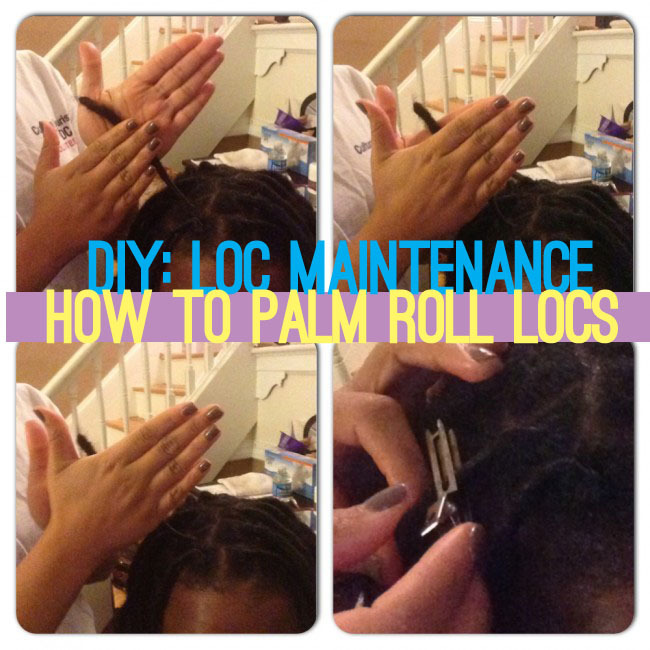 Now take the loc in between the two (2) palms of your hands about 3 inches from the scalp. Put you right and left hand in preying motion and roll the loc with you right hand moving down while your left moves goes up. Repeat the palm-roll until you have achieved a tight cylindrical look. Clip down the loc to the scalp that has been palm rolled. Continue the palm roll technique on each loc. Once all locs have been palm-rolled or you have achieved your desired style sit under the dryer until dry. Drying your hair depends on length, the average head takes 50 minutes to dry. Don’t use hydrophobic (water repellent) products such as beeswax, as they will dry out your hair. Don’t palm-roll more than every 4 weeks, too much tension on your hair will cause breakage and uneven locs.